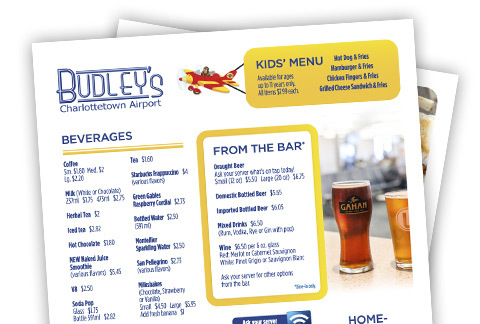 Satisfying and convenient, Budley’s restaurant at the Charlottetown Airport offers you meals in minutes. Whether you’re waiting for a departure or an arrival, in need of a snack to take onboard, or just craving one of Budley’s signature meals to eat in or take out, you’ll find what you’re looking for on our menu of Island favourites. In a rush? You can even place your order in advance by clicking our “Order Now” button. We open at 4 a.m. each morning with a full hot breakfast and other early morning options, while our onsite baker prepares baked goods from scratch. Throughout the day, we offer home-style cooking and local choices like our famous lobster chowder and lobster roll. Check out our daily specials, and choose counter service, table service or take-out. Relax with a cold beer or a cocktail in our fully licensed bar. You can even take home a last-minute souvenir from our in-restaurant gift shop. Free Wi-Fi and USB plug-ins are available, and in-restaurant Arrivals/ Departures screens ensure that you can keep an eye on flight time. Forgot to grab a bite before your flight? Budley’s has you covered. Pick up whatever you crave at Budley's On-the-Fly, located past Security in the Departures Area.